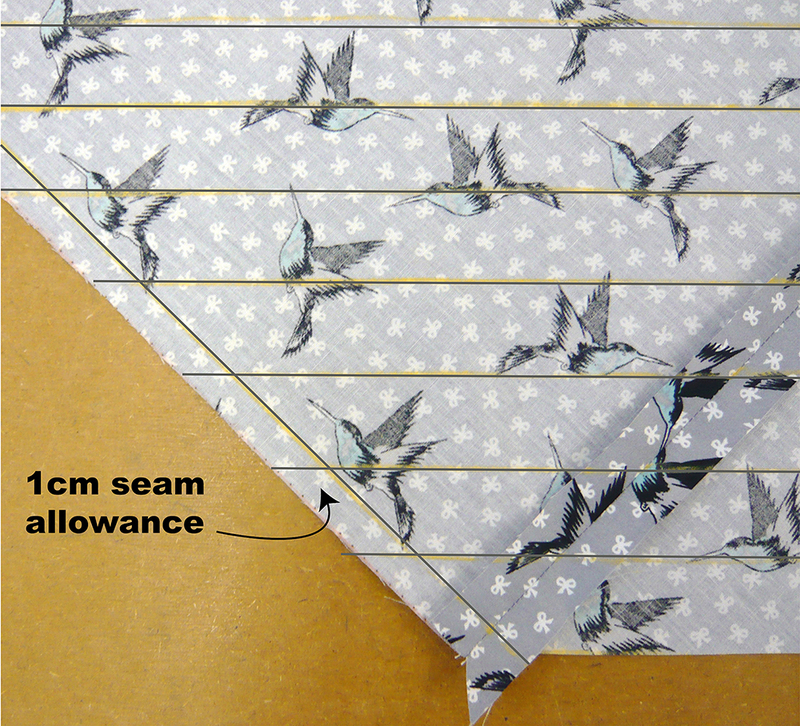 to reinforce/extend a fraying or too small seam allowance. Bias binding is made from strips of fabric cut across the bias. This is what gives it the ability to stretch around curved edges and is part of what makes it so useful. I’m going to show you a really thrifty method for making your own. 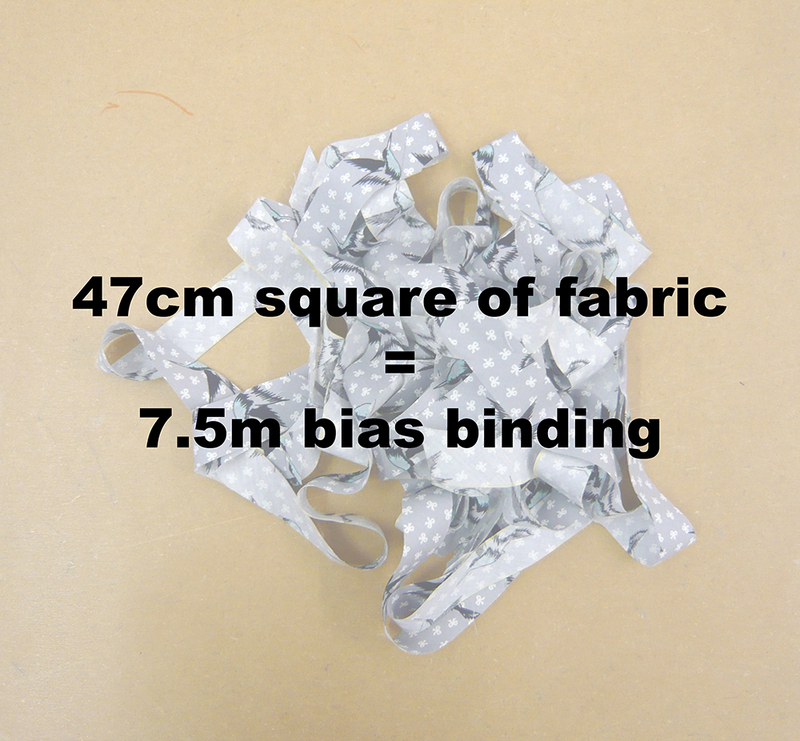 Light to medium weight woven fabric – bias binding doesn’t work so well in thicker fabrics. Matching colour machine sewing thread. 1. Cut a square from your fabric (make sure the straight grain of your fabric is nice and straight through the square – don’t cut the square at an angle). 2. Cut the square in half diagonally. 3. Bring two of the straight edges on each side of the square together to form a kind of diamond shape. 4. 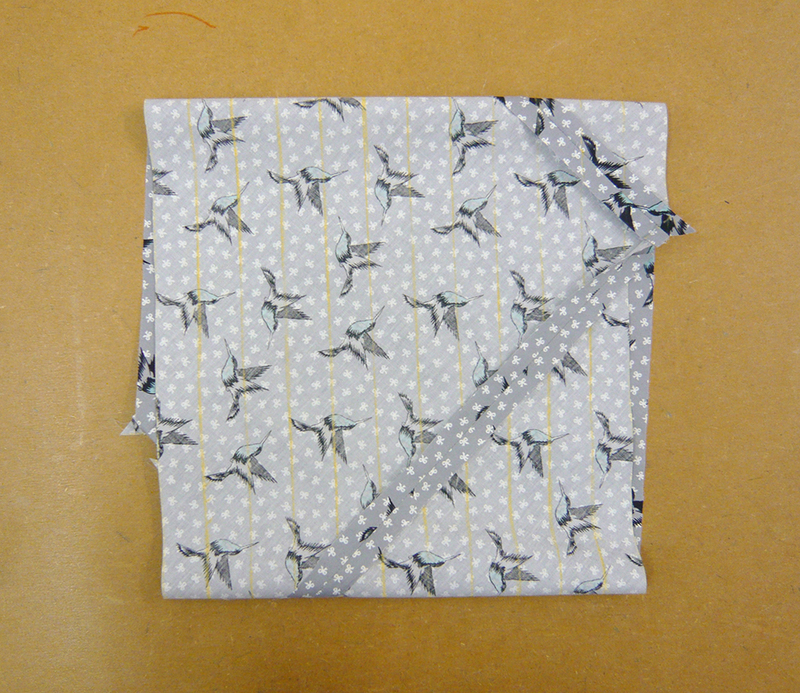 At the starred edge, place the fabric right sides touching and join with a 1cm seam. Allow the cut edges to overlap (as in the close-up) so that the ends join on the 1cm seamline. Press the seam open. 5. 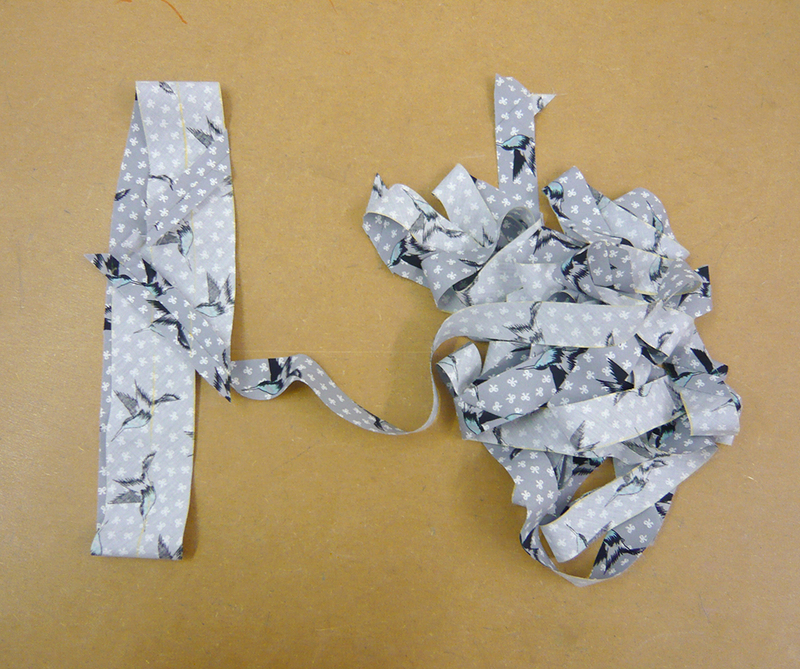 Decide on the width you want your bias strips (I did mine 3.5cm) and mark as many strips as you can across your fabric. Make sure you mark these strips parallel to the longest sides of your shape so that they’re running along the bias of your fabric! 6. 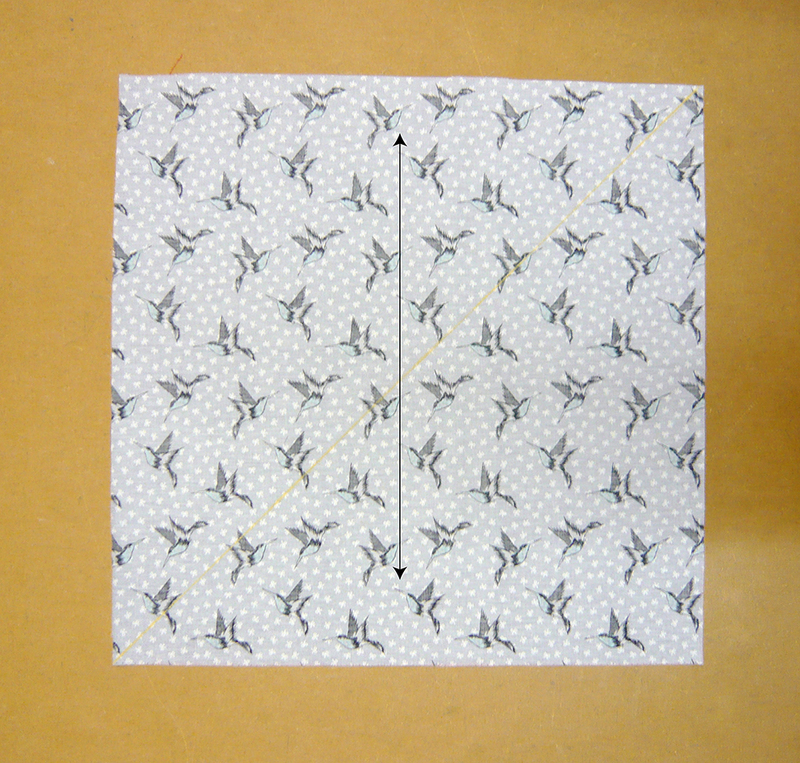 Mark a 1cm seamline across opposite edges of your fabric (going the opposite direction to your marked strips). 7. Your piece of fabric is now ready to fold into a tube. 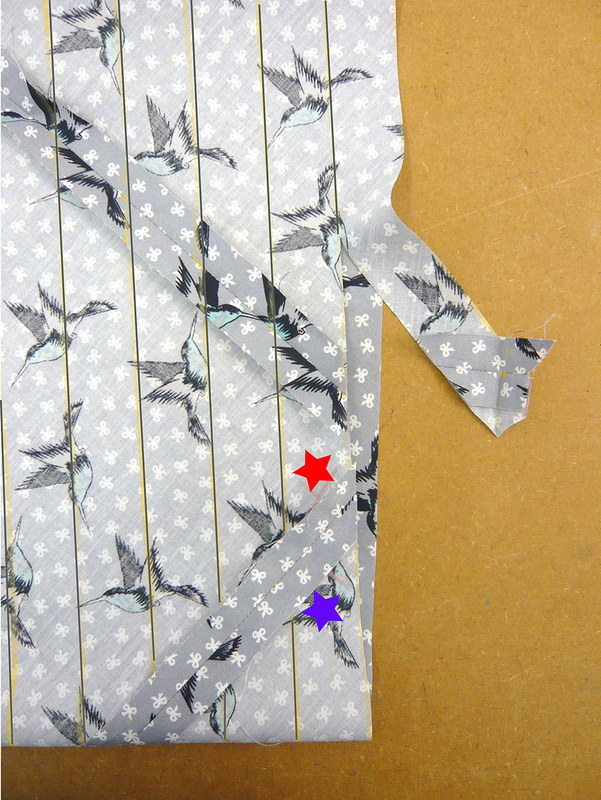 Before you do that, mark opposite ends of two adjacent strips on your fabric as shown in the picture. Make sure you have marked the right hand end of the first strip (purple star) and the left hand end of the second strip (red star) and not both ends of the same strip! 8. 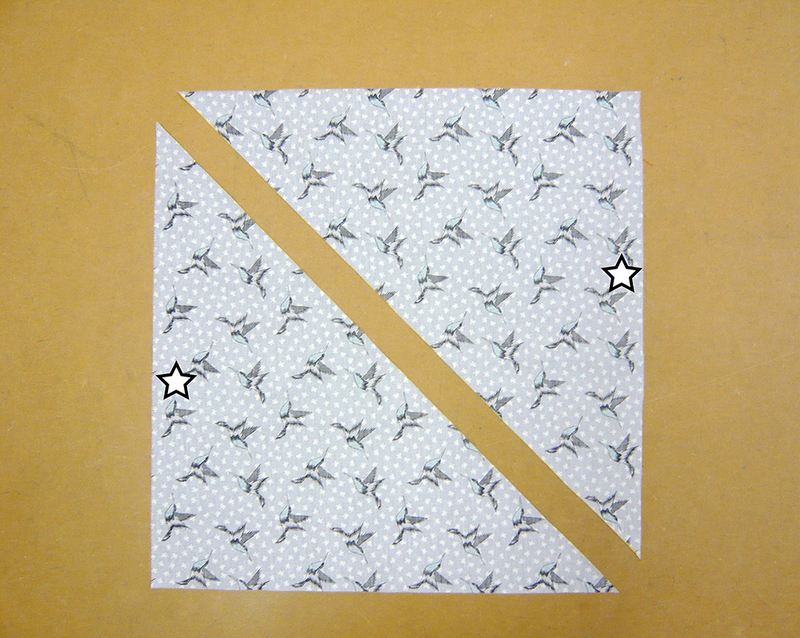 Fold the fabric so that the right sides of the fabric are touching and the 2 stars match up. It will feel a bit awkward at first, but be firm, you’re in charge! 9. Match up the ends of the strips along the seamline, making sure that the lines marking the strips will have a smooth join and aren’t offset. You will see that the ends of the first and last strips aren’t actually joined to anything. 10. Machine the seam and you should now have a tube. 11. You’re now ready for the magic…..start to cut along your marked strip lines at the end of the first strip that isn’t actually attached to anything. 12. Keep going and you should be able to cut your whole tube as a spiral, by following your marked lines. 13. If you did everything right, you should have been able to cut your whole piece of fabric in one continuous strip. How satisfying is that?! 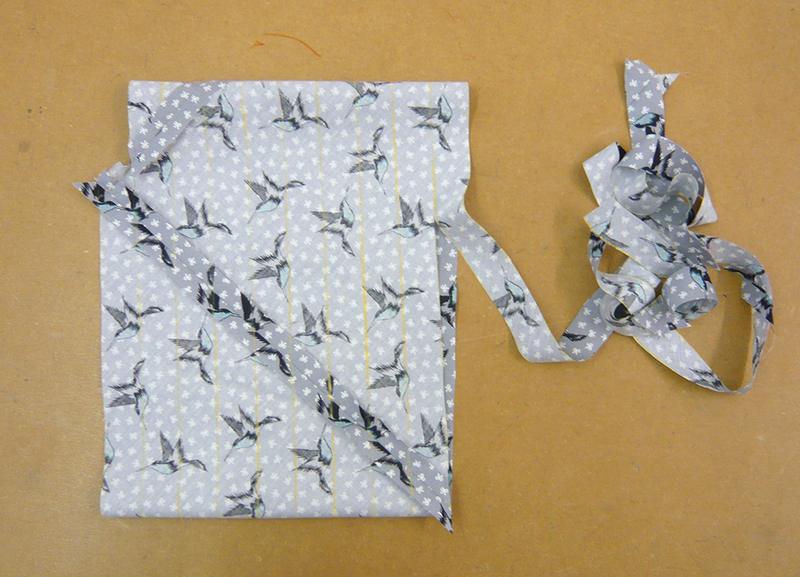 And how thrifty – I started with a 47cm square of fabric, which made 7.5m of bias binding! 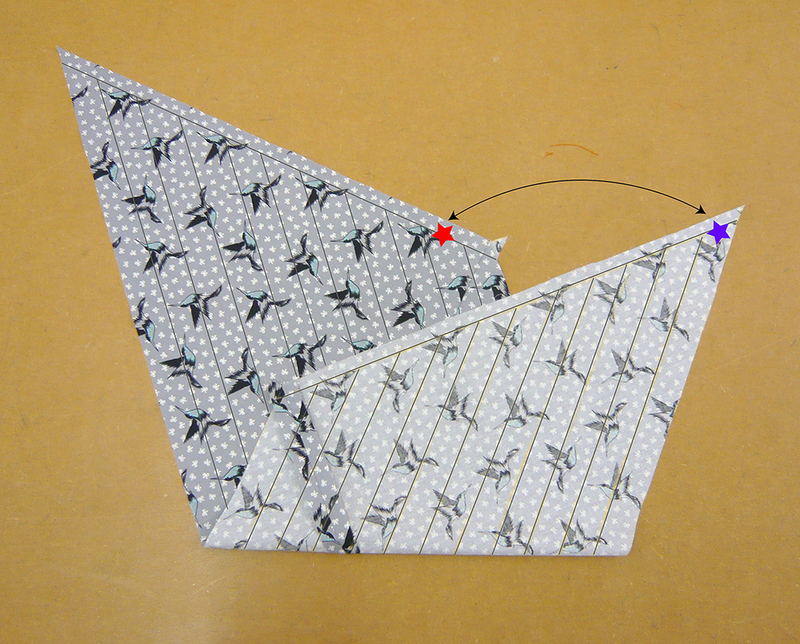 I’ll show you the best ways to use your bias binding in another post soon! 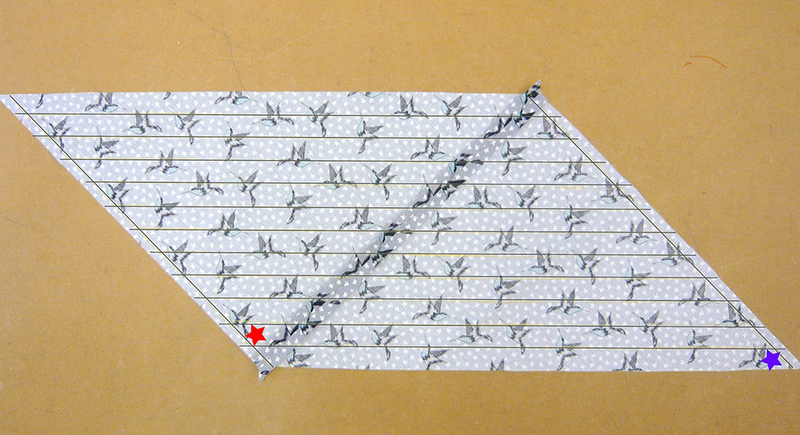 This entry was posted in Sewing Help and tagged bias binding, continuous strip bias binding, how to make bias binding, Wendy Ward, what is bias binding. Bookmark the permalink. 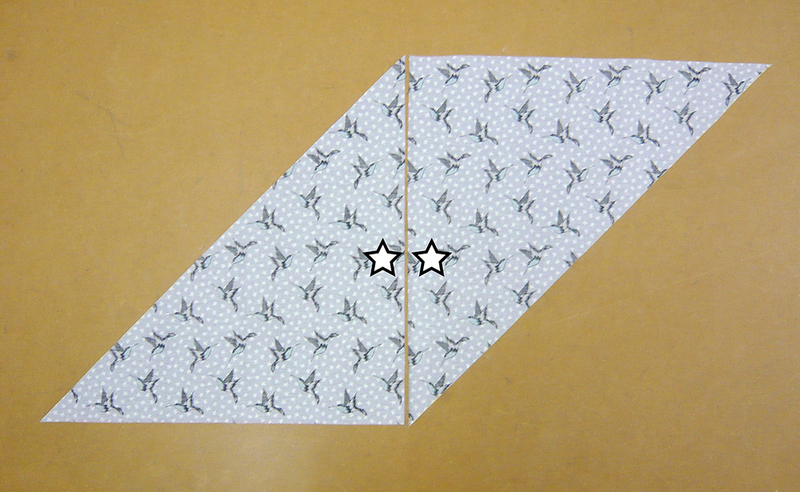 When you reach the stage of seaming the two triangles together why not use that shape to make a paper pattern piece. You can then cut out your fabric in one piece instead of two, so there will be half as many joins in the finished bias strip. 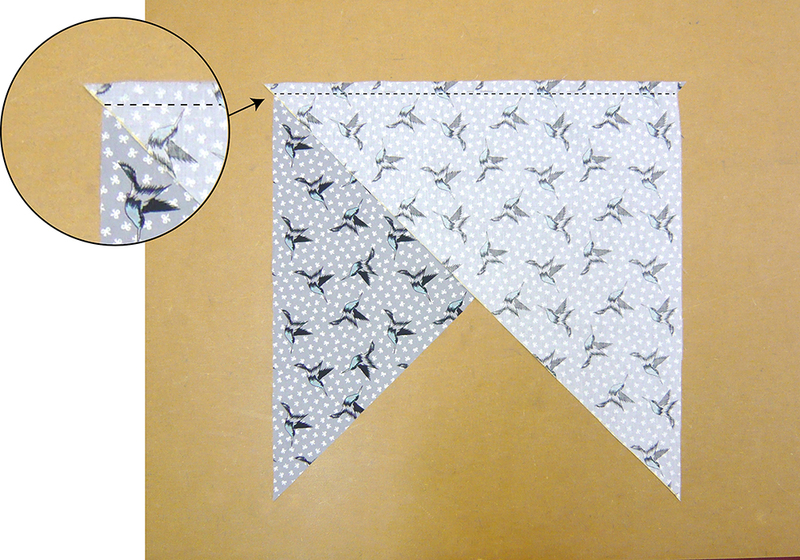 Just be careful to mark the pattern piece so you place it correctly on the fabric. Hi Anne, interesting idea, but the resulting shape could be quite wasteful if you didn’t have just the right shaped bit of fabric. Yes it would be nice to reduce the number of seams (and it would definitely make the process loads quicker! ), but one of my intentions with this technique was to be more thrifty with fabric. Personally I know I’m more likely to have square bits lying around rather than rhombus / diamond shaped bits. As soon as I have one I’m going to give it a go though!! Thank you for sharing this. I have made bias binding only once. It took forever to make the separate strips, then join them. I will certainly give this a try. My only concern is when you cut along the stitched seam does not it fray? I’ve read about this method before, but your pictures and instructions are so clear that now I might actually try it! This is brilliant! 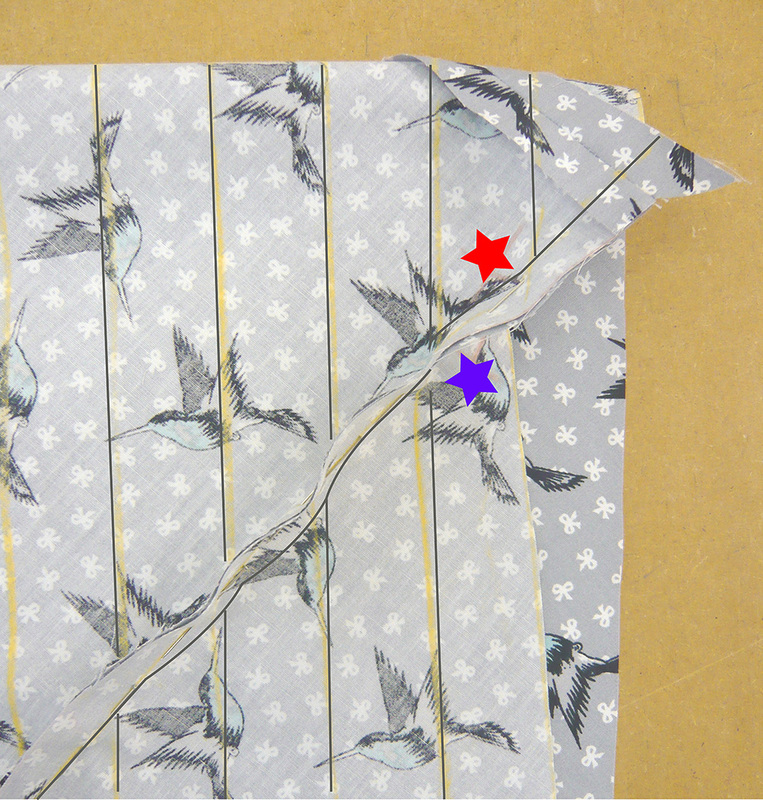 I’ve always been put off making my own bias binding because of all the sewing together of individual strips of fabric!